This page describes how Cloud Storage users can download content from their browser by logging in to their Google account. This type of access uses browser cookies to verify a user's identity. Before a user can perform an authenticated browser download, they must be granted permission to download the object. When granting a user permission, they are identified using their Google account. If you are using Cloud Identity and Access Management to control access to your objects, the user should have storage.objects.viewer permission, which is granted in the Storage Object Viewer role. If you are using Access Control Lists to control access to your objects, the user should have Reader access. If they are not logged in to their Google account, they will be prompted to sign in. Note: All requests to the storage.cloud.google.com URI require authentication. This is true even if an object is publicly readable. If you want users to download anonymously accessible objects without authenticating, use the storage.googleapis.com URI. For an example, see Accessing public data and click the API Link tab. When the user clicks the URL in their browser, they are automatically prompted to sign in to their Google account (if they're not already logged in). After they are authenticated, and their browser has acquired a cookie with an encapsulated identity token, they are redirected to the object in the Cloud Storage repository. Cloud Storage then verifies that the user is allowed to read the object, and the object is downloaded to the user's computer. 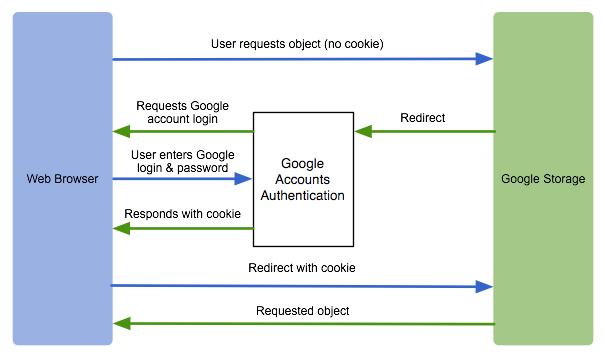 The following figure shows how the authentication process for browser-based authenticated downloads works. Learn how to access public data. Learn about options to control access to your data.